By default Microsoft Office applications add the items to the clipboard, so they can be pasted at a later time. Items pasted to the clipboard will be temporarily available to other documents, regardless of whether they are Word, Excel, or PowerPoint documents. Items that are copied or cut in a document are automatically added to the clipboard. The last item copied or cut will be at the top of the clipboard, so using the paste command will paste the last item that was copied or cut. Make sure the Home ribbon is selected. In the clipboard section, click the arrow at the bottom, right of the section. This will open the Clipboard pane on the left side of the document. Click the desired item, and it will be pasted where the cursor is located. You can also delete items from the list by clicking the arrow next to it and selecting Delete. As mentioned before, the items in the clipboard are temporary. When all the Microsoft Office documents are closed, only the last copied or cut item will remain in it. All the older ones will be erased. Items in the clipboard also cannot be pasted in third-party application documents. This is because you need to use the Office clipboard to post older items in a document. Office also cannot include all the different types of items in its clipboard that LibreOffice can. LibreOffice can handle MathML. This is an XML language for formulas. Both the clipboards for Microsoft and LibreOffice lack the ability to hold items long-term, so they can be pasted over and over again in various kinds of documents. This is a hinderance to some power users. Users with these needs can use clipboard managers. These applications are available for Windows, Mac, and Linux distros. These stand-alone applications can copy and store many different items, so they can be based in almost any document and third-party application. They are available for download from the Web and the software libraries and stores for the various operating systems. The Windows applications are available through the Web. Here are three options. Comfort Clipboard: The application can store unlimited amounts of text, images, and other items. Costs start at $19.99 per installation. Clipboard Fusion: This application has a free version, but more advanced versions start at $15 per user. Ditto: This application is under the General Public License. The version you can install from the Windows 10 app store. There is also a portable version of this application that can run from a USB drive. 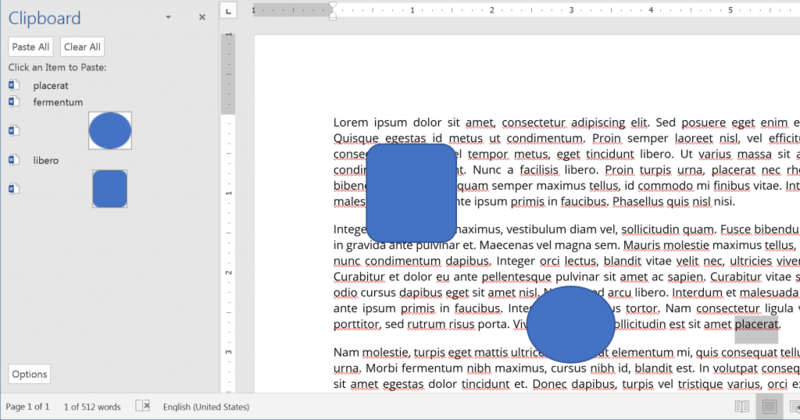 It allows you to save your copy and cut items then paste them into different documents on different PCs. There are several applications in the Mac App store. CopyClip: This free application runs from the toolbar, and it saves all your previous copy and cuts. Paste Queue: This app is also free. It allows users to copy many items then paste them all at once in a single document, if desired. There are several clipboard managers in the PPA’s or software centers for the various Linux distros. CopyQ: This application saves content that you add to it in customized tabs. In addition to various Linux distros, it is also available to Mac and Windows. GPaste: This application allows you to track and manage your clipboard history. Serious power users who like to have many items on the clipboard will find that both LibreOffice and Microsoft Office fall short of their expectations. Microsoft’s clipboard is more advanced than LibreOffice’s, but it can only have multiple entries as long as there is an Office document that is open. This is great for users who are only working with items they are copying and pasting within documents open in Microsoft Office, and they will be done with those items when they shutdown their computers. Those who want to save text or images to use in other applications and for longer-term projects will want to use one of the clipboard managers presented above. A clipboard manager makes reusing text and objects easy and flexible.